We’re Dreamin’ of the Caribbean!!! Hello “The Cupcakerie World”! These past few weeks have been amazing! Construction on our Downtown Morgantown store front is continuing at a fast and furious pace! The last several days have been spent revealing a beautiful original brick fireplace on one of the walls, purchasing cabinets and, of course, MAKING CUPCAKES! We are so excited and can’t wait to share our progress with you in the next couple of weeks! This week for Gloria Jean’s, we’re “Dreamin’ of the Caribbean!” (a delicious chocolate cupcake with an oasis of aqua butter cream)!! Our other DELICIOUS flavors are: Peanut Butter & Jelly, Butterscotch Cookie Monster (a rich butterscotch cookie in cupcake form), and fan-favorite Pina Colada (a summery coconut delight)! 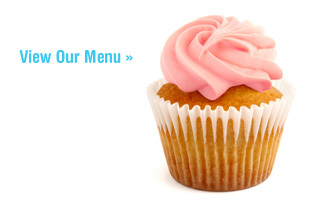 Make sure you head to Gloria Jean’s today or place your order at 304-216-6926 or www.thecupcakerie.com! This entry was posted on Tuesday, July 12th, 2011 at 10:23 pm. It is filed under Blog. You can follow any responses to this entry through the RSS 2.0 feed. Hey Janet–awesome looking cupcakes. I am headed to Morgantown first week of August and will be looking you up for sure! My husband and I are huge fans of your cupcakes!! We stop Gloria Jean’s almost every Tuesday :o) I’ve also ordered cupcakes for smaller events from you ladies and have had a great experience getting them! Can’t wait to try the flavors from this week! We are also headed up to Morgantown Sunday through next Tuesday. Beside your regular “delights”, we hope you will be offering a sugar free choice as well 🙂 Looking forward to visiting! !